The story of the railroad is the story of America. Rail lines transformed the towns they passed through, hastened the growth of cities, and changed the course of immigration, labor and technological innovation. 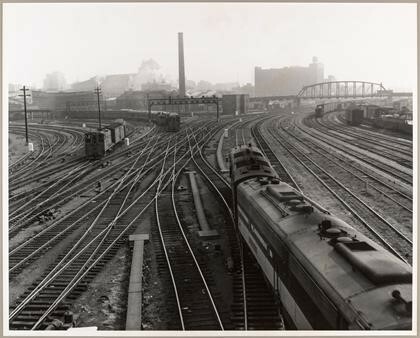 Now, through a grant from the National Historical Publications & Records Commission (NHPRC), 65 railroad collections held by the Cornell University Library’s Kheel Center for Labor-Management Documentation & Archives in the ILR School will be organized and made freely available online, adding rich detail and new depth to that uniquely American tale. The 18-month grant, worth $126,064, will pay for an archivist to organize more than 300 boxes of material and digitize around 1,600 photographs, including images of specific locomotives, rail yards, depots and train parts. Spanning the 19th and 20th centuries, the Kheel Center’s collections document the rise and fall of railroads, as well as the emergent and declining power of the unions that kept the railroads running and the American economy growing. The collections include the records of companies, unions and associations; rulebooks and payrolls; reports and photographs from commissions; and transcripts of oral histories with major industry figures. The materials are detailed and wide-ranging. Railroad companies’ records reveal important information about legislation, unionization efforts, discipline and discrimination. Papers from individual unions offer in-depth studies of specific cities and communities. Files documenting efforts to support family members will interest students of gender roles, families and work-life issues, while railroad advertising and train design memorabilia could aid those studying visual arts, architecture and urban planning. The digital archive will be a major resource for historians of everything from locomotive technology to commercial photography to capitalism, as well as railroad enthusiasts. The NHPRC, affiliated with the National Archives and Records Administration, supports activities to preserve, publish and encourage the use of documentary sources, created in every medium ranging from quill pen to computer, relating to the history of the United States. A version of this story initially appeared in the Cornell Chronicle.